I Am I Said lyrics were written by Neil Diamond at a time in his life where he was experiencing some very personal moments. It also has a dark side to it, which you can read about in the “background facts” below the lyrics. It’s a song about someone who lives in one place but yearns for another. Perhaps you can relate to his feelings expressed here? Feel free to share your thoughts about this song and its meaning for you, in the comments area. 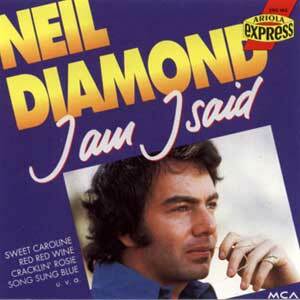 “I Am… I Said” is a song written and recorded by Neil Diamond. Released as a single on March 15, 1971, it was quite successful, at first slowly climbing the charts, then more quickly rising to number 4 on the U.S. pop singles chart by May 1971. It fared similarly across the Atlantic, reaching number 4 on the UK pop singles chart as well. – New York City and Los Angeles. But Diamond has also revealed another inspiration for this song: an unsuccessful tryout for a movie about the life and death of the comedian Lenny Bruce. Author David Wild interviewed Diamond for a 2008 book and he discussed how his efforts to channel Lenny Bruce evoked such intense emotions that it led him to spend some time in therapy. “I Am… I Said” was later included on Diamond’s November 1971 album Stones. The single version leads off the LP, while a reprise of the song, taken from midway to a variant ending with Diamond exclaiming “I am!”, concludes. Critical opinion on “I Am… I Said” has generally been good, with Rolling Stone calling its lyric excellent in a 1972 review, while The New Yorker used it to exemplify Diamond’s songwriting opaqueness in a 2006 retrospective. Maybe saying “I Am” meant he was God. “I Am… I Said” has been included in live versions on Diamond’s Hot August Night (from 1972, in a performance that Rolling Stone would later label “fantastically overwrought”) and The Greatest Hits: 1966-1992 (from 1992), as well as in various compilations.